As with skin henna, there are a million different ways to mix henna to use as a hair dye. Not all of them are good for the hair. This is a simple straight-forward hair henna recipe. It’s easy and reliable without weird ingredients. Mix a high quality BAQ henna powder such as ORa organic henna or Jamila henna with lukewarm water until you get a consistency of pancake batter. ORa henna and most other hennas need about 4 hours for dye release when mixed with lukewarm water. Jamila henna requires 6 hours or more for dye release when mixed with lukewarm water. USE GLOVES, to apply henna paste to clean dry hair, being sure to saturate every strand. Knead the henna into the hair with your hands. The henna should be applied very thick. Either wrap the hair with plastic wrap or put a plastic cap over your hair, pressing down so it touches the henna paste. 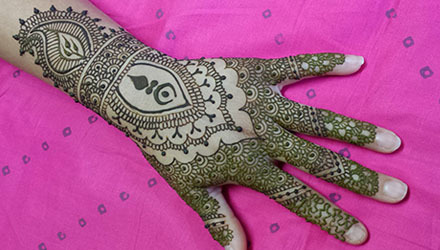 Wipe off ANY henna that is on the skin, as it WILL stain. Leave the henna on your hair for 2-4 hours. The longer you leave the henna on the hair, the richer the color. You can leave the henna on for longer and not harm your hair or skin. Leaving henna on overnight will yield really rich color. Rinse the henna out of your hair. This is not the easiest task and may take awhile if you have long or curly hair. Follow with a quick shampoo and conditioner. IMPORTANT! The color you see after rinsing your hair is NOT the final color of your hennaed hair. The color will tone down, getting darker and less orange over 3 or 4 days to your final color. This change can be dramatic, so don’t judge the color until day four. Using a henna gloss is a great way to pep-up your hair color and add intense conditioning to your hair every so often. A henna gloss is also a wonderful option if you don’t want to commit to full-blown henna color. A henna gloss leaves less color than a full henna recipe. Mix henna paste (as instructed above) with your favorite hair conditioner in a ratio of 1 part henna to 3 parts conditioner. Apply to hair and allow to sit for 30 minutes to an hour. The longer you leave the henna gloss , the more color will be deposited on the hair. If you have left over henna paste from dying your hair, separate into individual “servings and freeze them in plastic bags. This makes it easy to create a henna gloss on the fly. You can add a little bit of sugar or conditioner to the henna when you mix it to make it easier to work in and out of the hair. If you don’t like the smell of henna, add a teaspoon of ginger powder to the henna to neutralize the scent. You can add scent to your henna by adding rose water. If you elect to add essential oil, only add a couple of drops to the paste or you WILL get a headache. Essential oils are very strong and should be used carefully. The easiest way to rinse henna out of your hair is to swish your hair around in a bathtub to loosen the henna, then shower. For deeper color, reapply henna as often as you like. You can henna just your roots or your entire head. For hair henna, so not mix with lemon juice or it can dry out your hair. Add conditioner to the henna to add a touch of extra instant conditioning. If you have curly hair, henna may loosen your curl pattern. You can buy high quality BAQ henna powder online here.